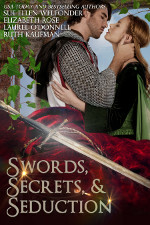 For this week’s Medieval Romance Monday we are featuring Swords, Secrets, & Seduction – a collection of 4 medieval romance novels. This set is available on Amazon now for only $0.99 cents! The fate of a battle-weary warrior depends on a mysterious woman, but when they join forces, the passion that consumes them poses a greater threat: a forbidden love so powerful it could destroy them. A lady on the run is looking to escape her betrothed, and a thief is looking to escape his life. Passion and love blooms between two people who shouldn’t be together, when they find each other’s life more intriguing than their own. He is an outcast THIEF known as the Black Fox, vowing revenge against those who unjustly stripped his father of his knighthood and lands. She is the PROTECTOR of the orphaned children of her village, promising to bring the Black Fox to justice for his dark deeds. Can Fox uncover the sinister secrets from their past and become the champion of his lady’s heart? Joanna Peyntor sees the world through the jewel-like windows she creates, with her only goal to save her glass-painting workshop from ruin. Sir Adrian Bedford will do anything to restore his family name and estate. When irresistible passion makes their marriage of convenience inconvenient, will his dangerous secrets keep them from following their hearts? USA Today bestselling author SUE-ELLEN WELFONDER loves Scotland, medieval history, Celtic legend and lore, the paranormal, and animals. She also writes as Allie Mackay and lives on Florida’s southwest coast with her husband and her muse, Snuggles the writer cat. ELIZABETH ROSE is the author of over 55 books, an amazon all-star, and in the top 100 of amazon’s most popular, bestselling authors. Visit her website at http://elizabethrosenovels.com. RUTH KAUFMAN is a Chicago author, on-camera and voiceover talent and speaker who enjoys chocolate peanut butter milkshakes and singing in a symphony chorus. Accolades include 2016 Bookseller’s Best Award Best Historical and Best First Book winner and RWA® Golden Heart® winner. This entry was posted in Blogs, Medieval Romance Monday and tagged elizabeth rose, laurel o'donnell, medieval romance, medieval romance boxed set, ruth kaufman, sue-ellen welfonder. Bookmark the permalink.